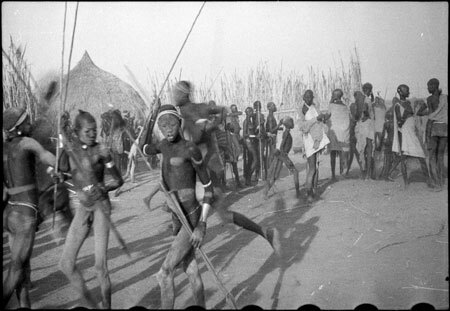 Youths carrying spears and ambatch shields dance together in the foreground, one wearing thiau armrings on his left arm, another on the right, with numerous other youths gathered to dance nearby next to a windbreak near a cattle byre (luak) at a cattle camp. Morton, Chris. "Nuer dancing" Southern Sudan Project (in development). 03 Jan. 2006. Pitt Rivers Museum. <http://southernsudan.prm.ox.ac.uk/details/2004.130.32940.1/>.